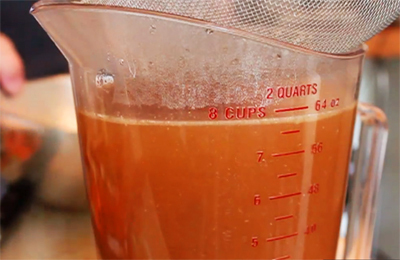 Food Wishes Video Recipes: Roasted Chicken Broth – Part 1 of The Ultimate Chicken Noodle Soup! Hi chef John. Can you please make a Kale salad or dish ? Shmaltz in generally made by rendering pure chicken skin & fat. Dark Jewish penicillin; Sammy Davis would have loved this! Chef: the next up photo is the most beautiful to date! Just as I get a head cold, Chef John comes in with a chicken noodle soup recipe. I really do love you!! Your obviously WAY ahead of me chef. This looks like its gunna be great! my grandma (of polish Jewish origin) makes the broth only from necks wings and feet ("poor soup") and all the schmaltz goes to fry the onions for the Crepalach (dumplings) I'll sure try the ketchup next time we make it. I'm actually not a fan of chicken soup, but damn! You sure do make this look gooooood! So, I like how you just snuck that in there, that bit about the difference between a stock and a broth. I've been operating, for more than 20 years now, under the impression that there really wasn't a difference between a stock and a broth. We call it a stock if it's going to be an ingredient, and we call it a broth if it's on the clear-soup spectrum of something we're going to eat as is, or with meat and veg added. But I know you have classical training and all, so I'm figuring you've got the low-down. Is there agreement about this? Whether there is or there isn't, I'm all for roasting bones to make stock! Ketchup.... for reals? Okay, your recipes are always the bomb, so I'm going to trust you and give it a try the next time. Can't wait to give it a try. Well, I've never run it by Myth Busters or anything, but 30 years ago, a 300 lb German "Master" Chef (or so he claimed) told me that during my first year of culinary school at Paul Smiths, and I've gone with it ever since. I think one reason that some define a broth as "a stock that's been fortified with meat," is due to the fact that stocks to be served during the meal as a broth (aka consomme at the swankier places) were clarified with a "raft" of ground meat, egg whites, and vegetables. I attribute most of the stock + meat = broth legacy to that practice. I've always heard it your way chef john. I think Marcella Hazan defines it the same way. I did raise my eyebrow when you said ketchup! I love your videos and blog, it really makes me want to jump into the kitchen right now and start cookin! Im with Sembazuru. Here in asia, breast meat is the least prized part of the chicken compared to thighs, legs and even wings. I totally understand though. Modernist Cuisine had a pressure-cooked stock recipe with boneless chicken thighs and wings. Dont go paltry on your poultry. so mr. moto, tell me, tell us!!! I noticed you didn't use any carrots when making the broth - is that a personal preference? Love it! Looks great but wish I could have a substitude for the ketchup, only because ketchup doen't like my stomach. You're cooking with tap water, but isn't American tap water heavily laced with chlorine? @Vincent - It really depends on your area, whether you use town or well water, and recent events. If you use well water, chlorine is not an issue. If you use town water, you can get a report from town hall (these days its often available on the town web site) to see if and how much chlorine is in your water. Yes.. chlorine, arsenic, anthrax, nightshade, mercury and other toxic poisons. Not sure about other areas, but San francisco has amazing tap water. I was always under the impression stock had bones and/or meat, broth has neither. Thus there is no such thing as vegetable stock, only vegetable broth. Already asked, didn't see an answer, should the neck be thrown in? Yes! always throw in the neck! Lior Goell: I was so glad to see your comment on Jewish made stock and schmaltz. I've been making stock lately with bags of chicken necks and backs from the butcher as my daughter is eating so much homemade stock I can't keep up with just leftover bones. I found quickly when I roasted those in the oven I got a HUGE amount of lovely clean yellow schmaltz which I cleaned and stored for potatoes and onions. Heaven even for heathens. And the stock made from those 'throwaway' parts has been stiff with that lovely gelatin. I can hardly bring myself to make stock with any of the parts that have good meat on them though I know it adds to the richness. Great idea making the stock in the same roasting pan. I transfer the good stuff to the stockpot which is an extra step. "sometimes i just sit and stare at the steam coming out of a cooling chicken..."
Thank You for the great Videos and the awesome culinary education you provide. Haha, I loved your addition of ketchup and I swear didn’t raise my eyebrows cause I made chicken stock a couple of days ago and I had to sneak in ketchup because I was out of tomato paste. I mean I literally sneaked it in because I did not want anyone in my family to know. For us Mediterraneans, ketchup in stock is a big no no; it’s either tomato paste or tomato. But let me tell you, at the risk of being haunted by my ancestors, I don’t think that I ever turn to tomato paste or tomato again. Ketchup gives your stock such a depth of flavor and rich colour. Unbelievable. So listen to Chef John and squeeze in that ketchup. Chlorine is usually added into tap water at treatment plants as a gas. Left by itself in an open container, the chlorine gas dissipates after 24 hours. My guess is the act of boiling the water, even for a short time, will drive off any chlorine that remains in the tap water. I am halfway into the recipe....I just finished the roasting part. After the chicken cooled enough for me to handle it, and taste it), I almost fell down right there in the kitchen! The white meat was like none other! This was a revelation...usually we roast longer to make sure the dark meat is done, and that's too much fr the white meat! Will post about the final result...but I already know it will be extraordinary! Dear Chef John - I stumbled upon your glorious website just yesterday. My 6 yr. old daughter requested that I make her chicken noodle soup. How could I say No when she just got a really painful shot and she needed chicken-noodle-soup lovin'? Today I made it and it is sooo delish and beautiful. I really appreciate your special blend of culinary expertise and sense of humor. Thank you! 1. Do you put the skin back in or leave it out? 2. I have a cast iron dutch oven... Does that make a difference? Thanks for all the great recipes Chef! I am a loyal follower. This is my second go-round with this recipe. Absolutely sublime the first time. Do I need to make sure the chicken is cooked to 190 degrees? The first time, I did cook the bird until the breast measured 190. This time,,,not so much. 190? No! Where did you get that temp?? Chef my broth ended up wayyy too dark (like beef broth dark) how can I fix this? You can't lighten a broth! Why would you want to?? You could add water but that would just dilute it. What do I replace this with? Chef, in anticipation of cooler weather, I bought a bag of frozen chicken backs at the butcher shop today. I was also inspired by your unroasted chicken stock recipe. I'm thinking of making stock (or is it broth?, I never get them straight) by roasting the backs first as you did in this recipe. Any thoughts or tips? Thanks! No tips needed! Just brown and simmer. I burned the soup, but it was incredibly delicious. I roasted the vegetables with the bones from several de-boned breasts used for your "Chicken & Mushrooms" recipe, but forgot about them and did not hear the timer. They roasted for over 2 hours and were very dark when i finally rescued them from the oven. The fond on the bottom of the pot was black. I assumed that the broth would be ruined, but as I had nothing to lose but some water, ketchup and garlic, I proceeded with the recipe, adding a chicken carcass from dinner the night before. The resulting soup is delicious. It's about as dark as french onion soup made with beef stock and it's hard to convince others that it's really chicken soup, but they all love it. I may burn it next tile too. Hi! Thanks for this recipe! I made it last night, but when I took out the chicken from the oven, the upper breast was not totally cooked yet. Should I just leave the chicken in the oven for few more minutes? Also, what do you do with the dark meat after making the broth? Do throw it out or can you use them for something else? Thanks!!! I'm really confused how yours turned out the way it did. I roasted my chicken, which I left out to warm up to room temp, at the same temp/time as you did. My chicken came out very pale, no browning really on the bottom of the pan. Put it in for another 10 minutes, not much changed. Proceeded on with the recipe, found my chicken still a touch raw in the breasts, and my broth turned out very pale due to the little browning. How did you achieve that?! Not for certain, Jeremy, but did you leave the pot uncovered in the roasting process?? I would think your problem lies there. 400 should be enough to brown any chicken in 45 minutes. Chef I was wondering why for stock you are a 12 hour simmer man, but for broth you simmered for much less? This came out beautifully, and the resulting chicken noodle soup was amazing as well. Thanks so much for posting this....I've made it a half dozen times in the past few months and it is really really great!